When I think of super foods I envisage a mum eating a head of raw broccoli and then feeling like she could fly into her housework with a cape! I tried eating from my super food list for 21 days to investigate the notion that you are what you eat. Summary? Short of feeling like I needed a cape for my efforts, I did feel fired-up and energetic. Yes! I was a woman on a natural high! On the final day I decided to conclude my experiment with a stop at my local bakery. Actually, I had been secondhand clothes shopping for way too many hours and there wasn’t a capsicum i site. So I bought myself a big, fat piece of bakery carbohydrate. My choice? One of those pizza scrolls dripping with cheese, mayo and other nasties. Within 10 minutes of eating my large bread roll I noticed an immediate feeling of depression. My mood was extremely low and I wanted to drive myself home, slump on the couch and have a big nanna nap. I didn’t realise how fantastic these super foods were making me feel until my greasy bread roll experiment. The reason I originally researched and wrote this list was because I thought it would be fantastic to have the list handy for snacking. I’m a big grazing type of eater. I will eat small handfuls of different kinds of foods throughout the day. I’ll snack in the car, at my desk and will pop to the fridge between writing articles like these for a break. Ok. I admit it. Food has always been a great comfort to me and I do use food to lift my mood. So I got thinking. If super foods were the only snack in arms reach, it wouldn’t matter what I snacked on, as long as the snack was healthy. Snacking only on super foods was the goal. So the mission with this list was to create a go-to resource that would include purely healthy super foods. When shopping for the family I will pick some snacks off the list and purchase them so I will always have some healthy snacks on hand. 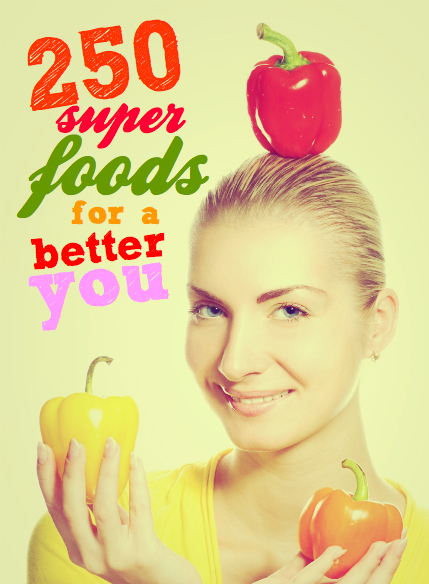 Believe it or not the term Super Food is actually a marketing term. But the term has evolved into a general way to categorise foods, which might make a person feel, well…super! When I think of eating super foods now, I think about a more ‘super’ me. I certainly did bounce out of bed faster, I had more energy for the kids, and housework was less of a chore when I was eating purely super foods for those three weeks. Marketing tricks aside, super foods do make me feel happier, they improve my mood and they give me energy. After eating from this list for three weeks I felt amazing. If you want to try it – simply purchase and eat from anything on this list for a period of 21 days. This is enough time to change previous bad habits. Don’t forget to post your thoughts and comments. Share your knowledge about your experience eating super foods. Keep this list handy when you are planning your next grocery shop. Simply pick items from the list that you enjoy eating and add them to your diet. Soon you will notice great improvements in your mood and energy levels.